Most little girls are drawn to yummy lip balm with cute packaging – and it’d be nice to indulge them. However, we all know that most of the lip balms on the market are full of chemicals, artificial colors and other icky ingredients. Not so yummy on your daughter’s lips. Luckily, there are a few safer alternatives. 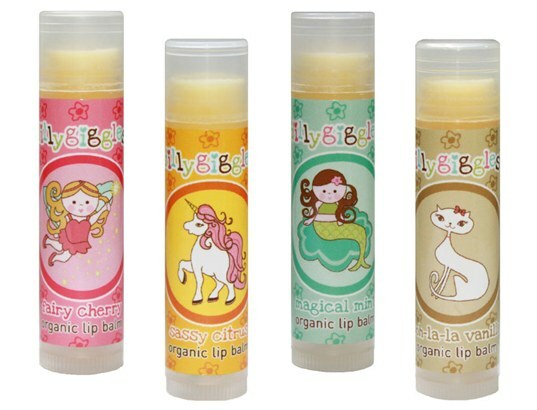 Dillygiggles Organic Lip Balms, for instance, are made with ingredients like organic sunflower oil, organic beeswax, organic jojoba oil, organic essential oil, vitamin E, rosemary extract and organic calendula. Although the lip balm itself is made with natural ingredients, the packaging isn’t dull. These tubes are still whimsical enough to appeal to little girls. Available in Magical Mint, Sassy Citrus, Fairy Cherry and Ooh-La-La Vanilla. Most little girls are drawn to yummy lip balm with cute packaging - and it'd be nice to indulge them. However, we all know that most of the lip balms on the market are full of chemicals, artificial colors and other icky ingredients. Not so yummy on your daughter's lips. Luckily, there are a few safer alternatives. Dillygiggles Organic Lip Balms, for instance, are made with ingredients like organic sunflower oil, organic beeswax, organic jojoba oil, organic essential oil, vitamin E, rosemary extract and organic calendula. Although the lip balm itself is made with natural ingredients, the packaging isn't dull. These tubes are still whimsical enough to appeal to little girls. Available in Magical Mint, Sassy Citrus, Fairy Cherry and Ooh-La-La Vanilla.